How will the shifting political winds affect U.S. climate policy? Emory seniors Emily Li (left) and Jennie Sun were part of an Emory delegation to Marrakech, Morocco, in November for a U.N. Climate Change Conference. “No U.S. president has been as vocal about climate change, or as focused on mitigating it, as Barack Obama,” says Eri Saikawa, an assistant professor in Emory’s Department of Environmental Sciences and an expert in public policy and the science of emissions linked to global warming. President-elect Donald Trump, however, has repeatedly called climate change a hoax. Among Obama’s initiatives is the U.S. Clean Power Plan – which established the first national carbon pollution standards for power plants. U.S. leadership was also instrumental in the historic Paris Agreement to combat climate change. The 2015 agreement, organized by the United Nations’ Framework Convention on Climate Change (UNFCC), brought more than 190 countries together to commit to a framework to reduce greenhouse gas emissions. “The Paris Agreement is an amazing achievement, and there was so much momentum and excitement surrounding it,” Saikawa says. On Nov. 7, delegates from around the world gathered in Marrakech, Morocco, to hammer out details resulting from the Paris Agreement. 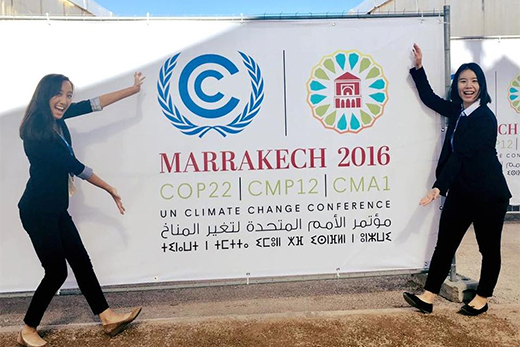 Saikawa headed a 10-member Emory delegation to Marrakech for the two-week event, known as the U.N. 22nd Conference of the Parties (COP 22). Emory, one of the few universities approved as an official U.N. observer by the COP, also sent a delegation to the Paris talks last year. Emory’s Marrakech delegation included six students and three staff members. They split into two teams, with half participating at COP 22 during the first week and the other half during the second.